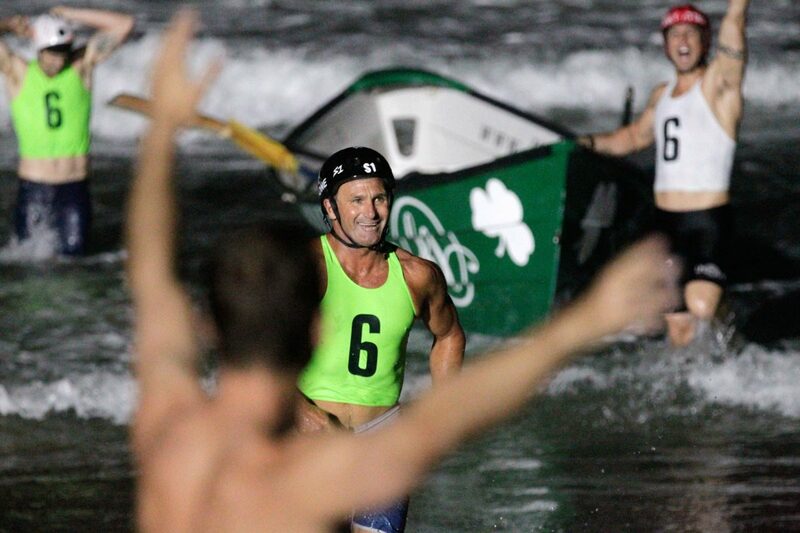 The swimmers kept them in the race, the paddlers delivered the lead, and the dorymen took the L.A. County Southern Section lifeguard team home through some seriously troubled waters, winning its fifth straight Judge Irving Taplin Medley Relay championship Saturday night north of the Hermosa Beach Pier. The fact that it was such a well-rounded team effort made it even more remarkable that Jack Bark’s leg in the race stood out. Bark entered the water for the anchor leg of the paddleboard component of the race — which begins with four swimmers and ends with four dory legs — with the team in third place. He left the water in first place, sending a palpable buzz through hometown spectators and even his fellow guards. Bark, the 24-year-old son of another legend, paddleboard maker Joe Bark, is already one of the most experienced paddlers on the planet. His obsession with paddling began at 4. By the time he was 18 he’d won a championship at the notoriously bumpy Molokai 2 Oahu paddleboard race, and two years later he tackled the Bass Strait, a 190-mile stretch from Australia to Tasmania. 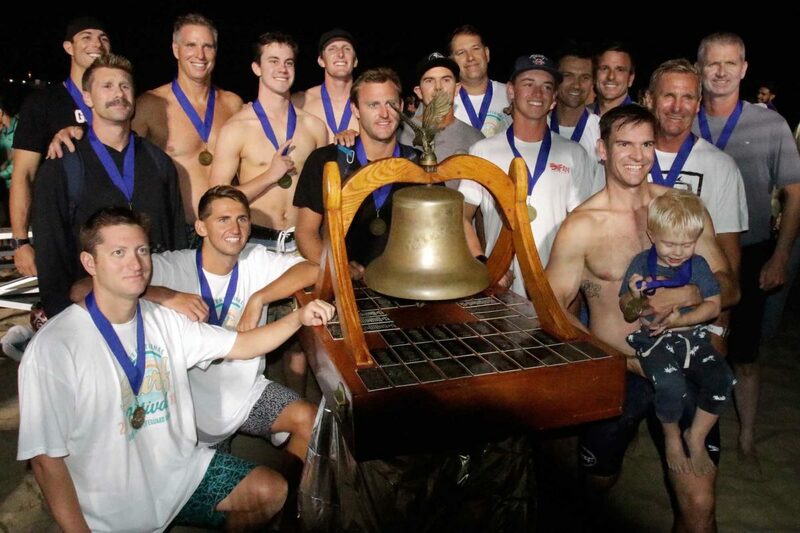 His history with bumps was key at Saturday night’s race, in which seven lifeguard teams from each section of LA County beaches (as well as a team from Cal State Lifeguards and another from San Clemente) competed for the Taplin Bell — the perpetual trophy that formerly was a ship’s bell on the tanker revered lifeguard Bud Stevenson served aboard during WWII. The race itself dates back to 1936 and was only interrupted from 1942 to 1945 due to the war. The waves weren’t huge but they were treacherous, making the 79th Taplin race one of the most memorable in recent years. When Bark got in the water, he saw two things he couldn’t help but like: paddlers ahead of him, and bumpy surf. Which is exactly what he did, catapulting Southern Section into the lead in what had been an extraordinarily tight race between the local guards and the Central and Northern sections (from Venice and Zuma, respectively). Bark hunted down the paddlers ahead of him and then pounced on them coming furiously towards the shore. Bark’s paddle gave the dory crew a lead, but to keep it they’d have to navigate the crashing surf, which would indeed later cause a thumping collision between two lagging teams and an capsizing of the Cal State dory. Swift, who with Mike Murphy rowed the first of Southern section’s four dory legs, said there’s a good reason why the most experienced guards man the boats. Bark looked on in admiration as the dory crews launched into the surf. The first dory faced the biggest waves and maintained the lead. By the team’s fourth dory, the lead was intact but had been narrowed. Zuma rode a wave in that very nearly caught the leaders, but then had a slow transition between the third and anchor dory crews that allowed Southern’s anchor team of Seth and Micah Carlson to get out past the break before their competition had reentered the surf. Southern Section executed quick turnarounds between all four dory crews. Seth and Carlson knew the Taplin was theirs for the taking if they could just get out past the break. In the traditional victory celebration, each member of the team rings the Taplin Bell the number of times each had won. Seth rang the bell 19 times, tying Mel Solberg for the most in the storied race’s history. Swift, although a veteran guard, rang the bell for the very first time. He just moved to California from the East Coast three years ago, fulfilling a lifelong dream. Swift lifeguarded in Florida a few years and spent 10 years in law enforcement before coming west. The Southern Section team ranged from 19 (swimmers Will Abele and Wyatt Kirchner) to 60 (doryman Mike O’Donnell). “We’ve got a good team, a lot of guys who just know how to swim and paddle and row,” Bark said. LACO Southern “A” team, swimmers: Kevin Fink, Ryan Bullock, Will Abele, Wyatt Kirchner; paddlers: Shane Gallas, Jack Bark, Jake Miller, Brian Murphy; Dory Crews: Mike Wurzel & Tyler Morgan, Tom Seth and Micah Carlson, Mike O’Donnell and Jeff Hart, Tom Swift and Mike Murphy.